The finale of the month long series of Visual Arts cumulates with the grand exhibition of works of art. There is a wide range of forms from oils & watercolours through to photography & collage through to sculpture & jewellery. Whilst there is always a strong influence of local/regional artists, the Show has been very proud to display and sell works from members of the International Society of Marine Painters, the Royal Society of Arts, the Hilliard Society of Miniaturists as well as the Society of Equestrian Artists. The 3-day event starts with an evening preview, this year to be opened by Elizabeth Truss, MP for SW Norfolk accompanied by the Mayor of Swaffham. Tickets can be purchased through the contacts on the web site prior to the event. Always very popular, the evening also allows the chance to purchase the works of your choice which can be picked up at the end of the Festival. 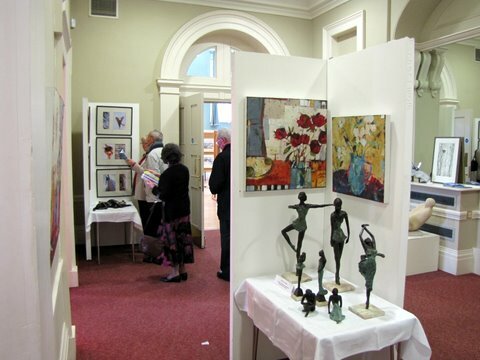 The Show has well over 120 artists exhibiting over 350 – 450 works of art each year and the commission on the sales goes to support the Rotary Club’s charities of Dictionaries for Primary School Leavers, Shelter boxes, Polio Eradication and many, many more. Collection of purchased works: after 16:30 or by prior arrangement. The sale of works continues through the weekend and there are always a merry band of Rotarians willing to help with any query or question. Amiably supported by our partners, as always, teas & coffees, homemade cakes & scones are on offer in the café.